Things are getting really weird in Fortnite. Thanks, Epic Games. The giant purple cube in Fortnite: Battle Royale is doing cube things once again. The cube has made another gravitational field on top of the large hill on the eastside of Greasy Grove, creating a low-gravity setting for people to jump higher than usual during games. The field extends partially into Shifty Shafts and on the edge of Greasy Grove. The other low-gravity field near Fatal Fields still exists, even though the cube has moved on from this location. Unsurprisingly, the cube has the same characteristics as before. It’s still burning runes into the ground, retaliating with bolts against players who shoot it, and giving shield to any players who walk near it. 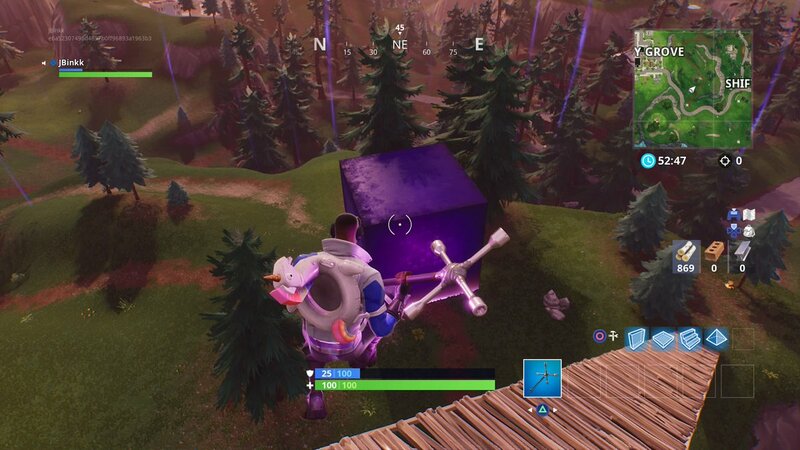 The cube will likely stay in its current position for little bit before moving once again. With the direction it’s going so far, it may move closer to Greasy Grove or toward Tilted Towers.